It’s Thanksgiving week and I should probably be posting pie recipes, but the recipe I really want to share is for these Mini Urban Legend Cookies. I’ve been making them a lot lately because Fuzz and I love them. We keep them in the freezer and try to resist the temptation of grabbing a handful every time it is opened. I call these Mini Urban Legend Cookies because they are a scaled down and modified version of the recipe from the story where a lady gets billed $250 for a recipe she requested at a tea room. 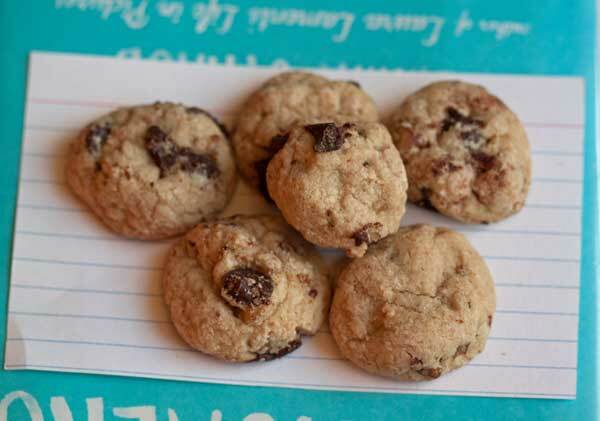 Made with ground oats, shredded milk chocolate bar, chocolate chips and pecans, the flavor and crunchy texture reminds me of Famous Amos cookies, though these are a bit smaller. And I like that they are smaller because there’s something satisfying about eating 5 mini cookies instead of 1 large. Silly, but true. So here’s the recipe. It’s very easy, but you will need some sort of grinding apparatus for pulverizing the oats and a bit of patience. Shaping tiny marble size dough balls gets old pretty quickly, so sometimes I just bake up 24 or however many I can fit on a sheet and throw the rest of the dough back in the refrigerator. However, if you do make them all in one session that’s even better because these freeze quite wonderfully. I think freezing even improves the texture. Mini sized crunchy cookies based on the old Neiman Marcus urban legend cookies. When made with pecans, they taste a little bit like Famous Amos cookies. For this recipe, I recommend using the nuts as they cut some of the sweetness of the cookie. Baking at a low and slow 300 degrees helps them have a uniform, crunchy, texture. Preheat oven to 300 degrees F. or skip this step if you plan on chilling the dough. Grind the oats into a fine powder in a mini coffee grinder, food processor or blender. You should have about 1 scant cup once ground. Mix the ground oats with the flour, baking soda, baking powder and salt; set aside. With an electric mixer, beat the butter and both sugars until light and creamy. Beat in the vanilla and the egg, then with a heavy duty scraper, stir in the flour mixture. Add the shredded milk chocolate and chocolate chips. To make tiny cookies, scoop the dough up by ½ teaspoons and shape into marble size balls. There should only be 2 to 4 chips (depending on the size of your chips) per cookie. Arrange the small balls of dough on a foil lined baking sheet and bake at 300 degrees F. for about 18 minutes or until the cookies appear set and dry. Transfer to a baking rack and let cool completely. When the cookies are completely cool, put them in a freezer bag and store in the freezer. The yield is approximate and will vary depending on how big you actually make the cookies, but you should get at least 70 and possibly more if you can keep the cookies tiny. If you can't weigh your flour, makes sure to fluff up the flour before measuring it so your cup of flour won't be too packed. The original recipe called for salted butter, but since first making these I have used unsalted many times. If you use unsalted butter, increase the salt to 1/2 teaspoon total. Additionally, if you are sensitive to salt and don't want a slight hint of salt with the sweet, you can use the salted butter and add no additional salt or 1/8 rather than the 1/4. For the milk chocolate, run a large chocolate bar down the side of a grater. It doesn't really matter how fine you grate it. The small amount of milk chocolate adds a bit of flavor and darkens the color somewhat. You can leave it out, but it does add a little something and I recommend it.